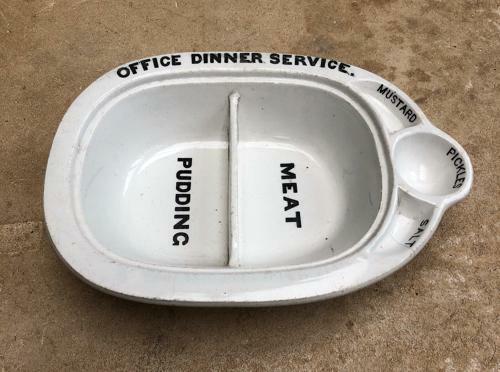 First one of these I have had....Wonderful Early 20th Century White Ironstone Pudding & Meat Dish. Sectioned areas black transfer print on white. MEAT & PUDDING centrally with Mustard, Pickle & Salt Sections. Along one side OFFICE DINNER SERVICE. Overall great condition. One hairline in the Salt.